In the exciting months leading up to Christmas, foodies have to contend with deliveries of festive treats, and the latest and likely my last for this year were some seasonal offerings from Rosebud Preserves; Christmas Fruit Chutney made with prunes, dates, apricots, aromatic allspice and strong dark ale and Almond and Orange Mincemeat made with with Bramley apples, vine fruits, citrus and a measure of brandy. Elspeth Biltoft founded her preserve company in 1989, combining the recipes passed down from her mother and botanical teachings of her father. 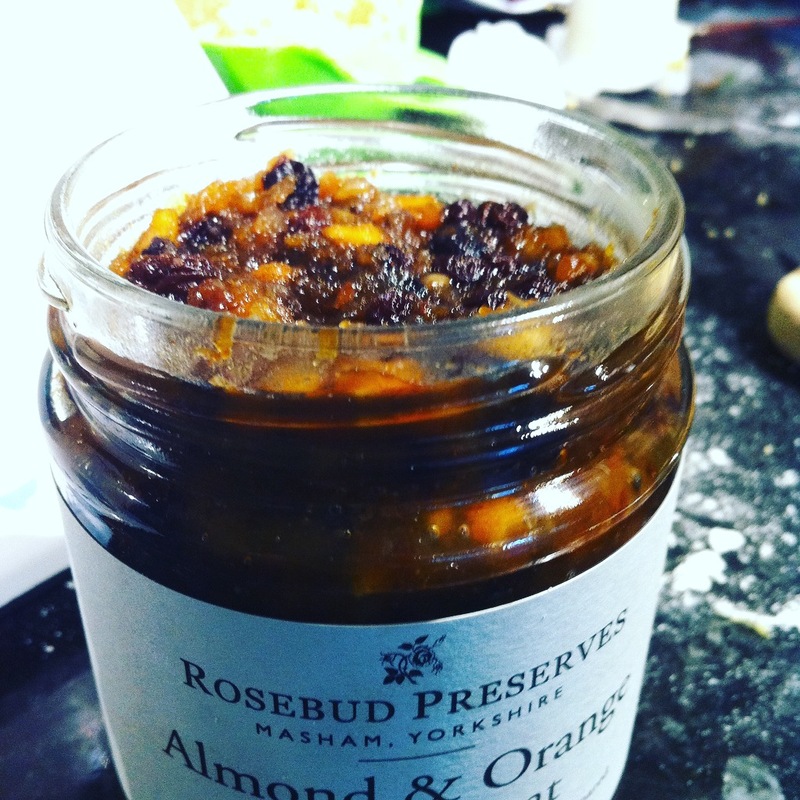 Based in Masham in North Yorkshire, Rosebud Preserves has grown bigger over the years but uses the same principals to create their range of chutneys, jams, jellies and pickles. There is a quality to a brand like Rosebud that I mean both literally and descriptively; they possess an instinctive and confident blend of flavours and ingredients that results in a product and taste that you simply cannot match on the supermarket shelves. While the chutney’s time to shine is with a piece of hearty cheddar or after Christmas day in a sandwich, I wanted to make something a bit different with my jar of Almond and Orange mincemeat; a little bit like the filling, this recipe veers from tradition slightly, but delivers a festive, rich and decadent sweet treat that your friends and family will love and that you can whip up in between all the gift buying and wrapping and Christmas concerts and parties. In a food processor whizz up the butter, flour, sugar and spice until the butter has broken down to little nubs in the mix. Don’t go for the ‘fine breadcrumb’ texture, as the little lumps of butter make the pastry more crumbly and light. Add the lemon juice and blend until the dough JUST starts to come together. Don’t over-process here otherwise the dough will be too difficult to sprinkle as a crumble for the topping. Use your best judgement and remember even if the mixture is crumbly, you’ll be able to press the dough into submission in the slice pan. Put aside at least a cup of the dough mix and press the rest into a small slice pan (26cm x 15cm roughly). Bake until lightly golden, about 15-20 minutes. Leave to cool a bit. 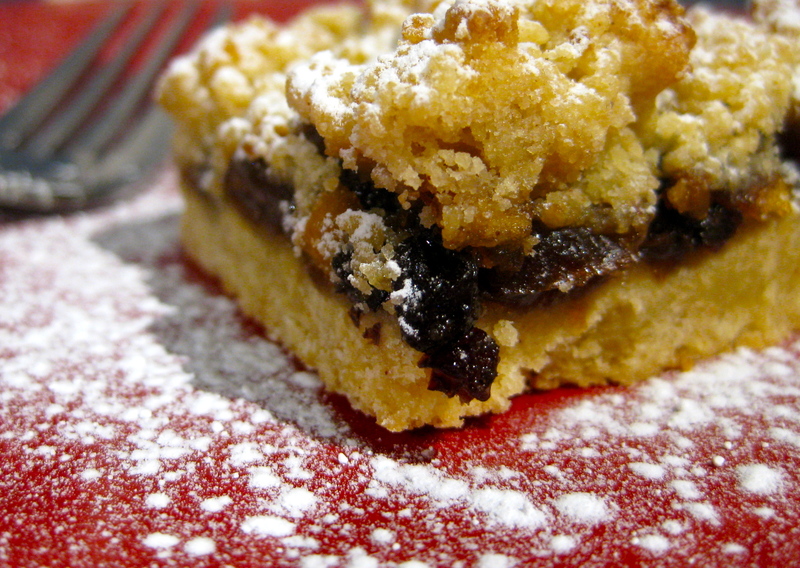 Spread the mincemeat filling onto the base evenly. 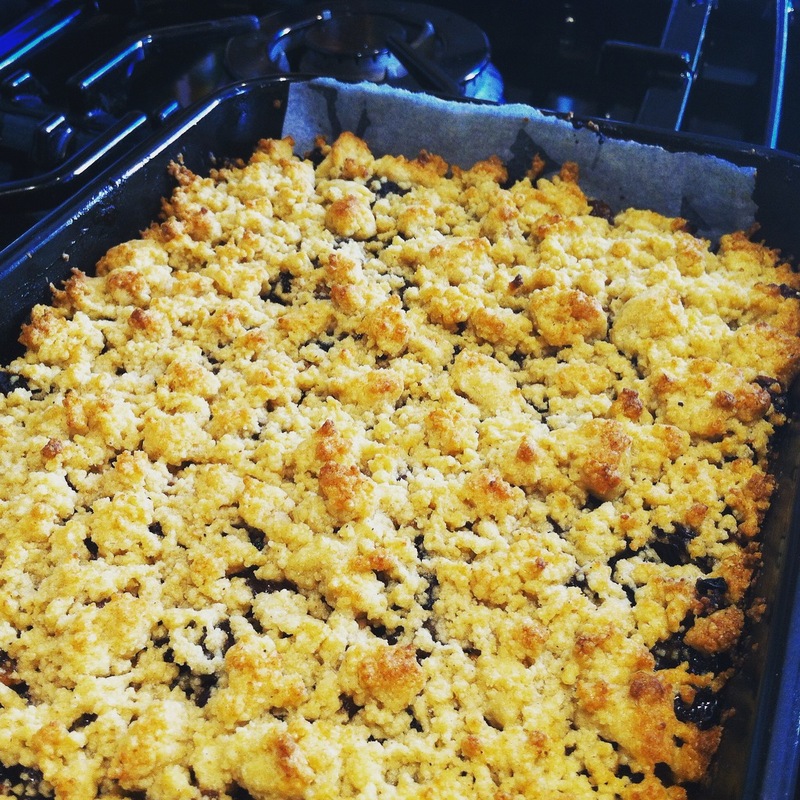 Sprinkle the remaining dough to form the crumble topping and bake for another 15-20 minutes until golden brown. Leave to cool and serve dusted with icing sugar or with a dollop of brandy cream.